Looking for stocks with high upside potential? Just follow the big players within the hedge fund industry. Why should you do so? Let’s take a brief look at what statistics have to say about hedge funds’ stock picking abilities to illustrate. The Standard and Poor’s 500 Index returned approximately 13.1% in the 2.5 months of 2019 (including dividend payments). Conversely, hedge funds’ 15 preferred S&P 500 stocks generated a return of 19.7% during the same period, with 93% of these stock picks outperforming the broader market benchmark. Coincidence? It might happen to be so, but it is unlikely. Our research covering the last 18 years indicates that hedge funds’ stock picks generate superior risk-adjusted returns. That’s why we believe it is wise to check hedge fund activity before you invest your time or your savings on a stock like Molson Coors Brewing Company (NYSE:TAP). Molson Coors Brewing Company (NYSE:TAP) was in 28 hedge funds’ portfolios at the end of December. TAP shareholders have witnessed a decrease in enthusiasm from smart money in recent months. There were 31 hedge funds in our database with TAP positions at the end of the previous quarter. 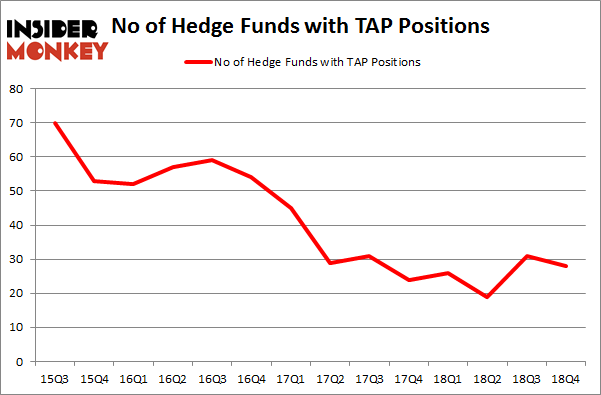 Our calculations also showed that TAP isn’t among the 30 most popular stocks among hedge funds. In the financial world there are a lot of methods investors use to appraise publicly traded companies. A pair of the less utilized methods are hedge fund and insider trading signals. Our experts have shown that, historically, those who follow the top picks of the elite investment managers can trounce their index-focused peers by a superb margin (see the details here). We’re going to analyze the recent hedge fund action regarding Molson Coors Brewing Company (NYSE:TAP). What does the smart money think about Molson Coors Brewing Company (NYSE:TAP)? At the end of the fourth quarter, a total of 28 of the hedge funds tracked by Insider Monkey were long this stock, a change of -10% from the second quarter of 2018. On the other hand, there were a total of 26 hedge funds with a bullish position in TAP a year ago. With hedgies’ capital changing hands, there exists an “upper tier” of notable hedge fund managers who were upping their holdings substantially (or already accumulated large positions). Among these funds, D E Shaw held the most valuable stake in Molson Coors Brewing Company (NYSE:TAP), which was worth $65.8 million at the end of the third quarter. On the second spot was Millennium Management which amassed $61.1 million worth of shares. Moreover, Arlington Value Capital, Diamond Hill Capital, and Renaissance Technologies were also bullish on Molson Coors Brewing Company (NYSE:TAP), allocating a large percentage of their portfolios to this stock. Because Molson Coors Brewing Company (NYSE:TAP) has faced bearish sentiment from the entirety of the hedge funds we track, it’s safe to say that there exists a select few hedgies who were dropping their positions entirely last quarter. Intriguingly, Kerr Neilson’s Platinum Asset Management dumped the largest investment of the 700 funds followed by Insider Monkey, valued at about $8.5 million in stock. Benjamin A. Smith’s fund, Laurion Capital Management, also dumped its stock, about $4 million worth. These bearish behaviors are interesting, as aggregate hedge fund interest dropped by 3 funds last quarter. Let’s now review hedge fund activity in other stocks – not necessarily in the same industry as Molson Coors Brewing Company (NYSE:TAP) but similarly valued. These stocks are Seattle Genetics, Inc. (NASDAQ:SGEN), Steris Plc (NYSE:STE), W.R. Berkley Corporation (NYSE:WRB), and Noble Energy, Inc. (NYSE:NBL). All of these stocks’ market caps are similar to TAP’s market cap. As you can see these stocks had an average of 21.75 hedge funds with bullish positions and the average amount invested in these stocks was $1087 million. That figure was $447 million in TAP’s case. Noble Energy, Inc. (NYSE:NBL) is the most popular stock in this table. On the other hand Seattle Genetics, Inc. (NASDAQ:SGEN) is the least popular one with only 16 bullish hedge fund positions. Compared to these stocks Molson Coors Brewing Company (NYSE:TAP) is more popular among hedge funds. Considering that hedge funds are fond of this stock in relation to its market cap peers, it may be a good idea to analyze it in detail and potentially include it in your portfolio. Our calculations showed that top 15 most popular stocks among hedge funds returned 19.7% through March 15th and outperformed the S&P 500 ETF (SPY) by 6.6 percentage points. Unfortunately TAP wasn’t in this group. Hedge funds that bet on TAP were disappointed as the stock returned 9% and underperformed the market. If you are interested in investing in large cap stocks, you should check out the top 15 hedge fund stocks as 13 of these outperformed the market. 5 American Companies that Will Benefit From the End of the Trade War 4 Ways To Play the Ride Sharing Trend Sarissa Capital Management Hires New President Were Hedge Funds Right About Souring On News Corp (NWSA)? 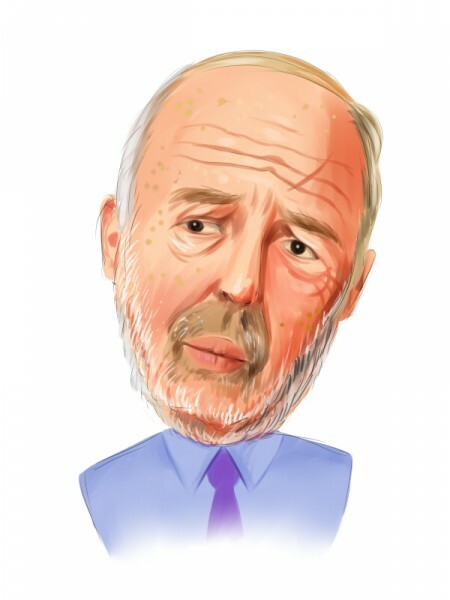 5 Ways to Play the Autonomous Driving Trend Were Hedge Funds Right About Souring On Teck Resources Ltd (TECK)?